﻿ What are the best file formats for my small business tasks? You are here: Home / Blog / Article / What are the best file formats for my small business tasks? What are the best file formats for my small business tasks? If you’re running a small or medium-sized business, you’re probably expected to wear many hats within the organization. In a typical day, you might be communicating with clients, sending faxes, interacting and exchanging documentation with suppliers, emailing internally with colleagues, responding to customers, or many more tasks. While the modern office environment makes all of these tasks feasible through digital means, it can be a challenge for some people to know which format is best for each of these tasks. In documents where formatting is important, Microsoft Word or other text document formats (e.g. .rtf) are not ideal. Depending on the viewer’s computer and Word Processor configuration, the text can appear wildly different than the sender intended. In most cases, the most efficient, logical format to use is PDF. PDF files maintain their formatting regardless of where they’re being viewed, and is widely- known, so even if the recipient is not computer-savvy, there’s not likely to be any confusion about how to view the file. Tagged Image File Format has become a leading standard for professions like the medical industry. TIFF is preferable to PDF in many industries for a number of reasons. Many of the best solutions for document capture are designed with TIFF in mind. As well, TIFF offers added security for important documents, as their files cannot be embedded with viruses or other malware. Yes, many businesses out there still use the fax in their day-to-operations. 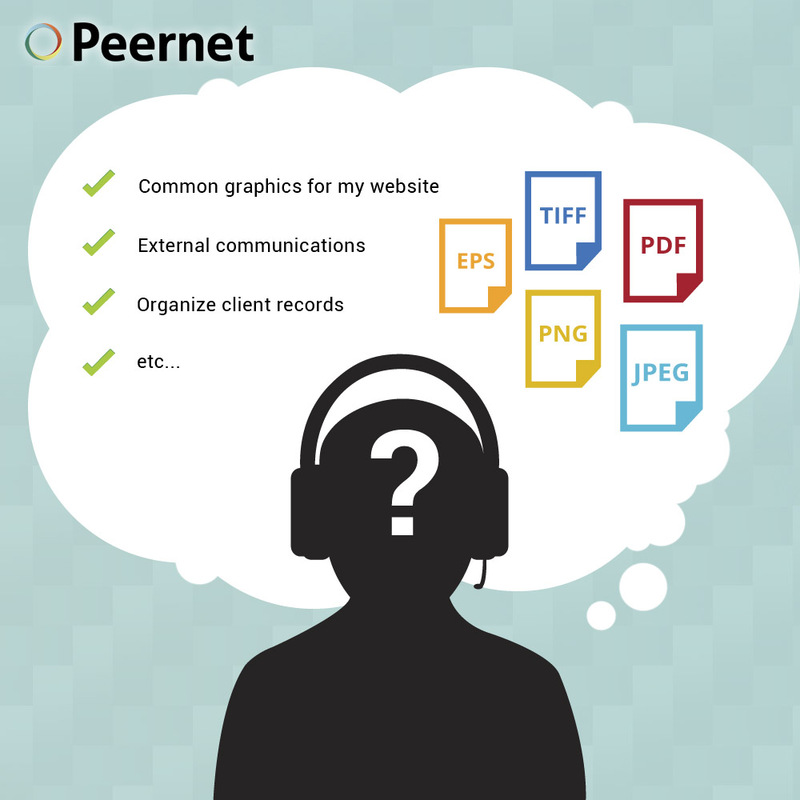 Peernet offers programs that easily allow businesses to easily create faxable TIFF files. If you are having new branding designed for your small business, any designer worth their salt will give you copies of the graphics in vector format. This ensures that the logo or images will remain clear regardless of where or what they’re printed on — so it will look the same whether it’s printed on a business card, or on the side of a building. There are a few different considerations when deciding which image format you should use. In most cases, JPEG and PNG are the standards for website design, as they maintain good enough quality for computer screens while keeping page loading times reasonable. If you’re putting together some handouts, cards, brochures or the like for your business, the TIFF file format is your best bet. While JPEG is ideal for computer screens, their lower resolution will often render them grainy on the printed page. TIFF is a lossless, compression-free format, so you can be sure that how you see it on the monitor is how it will appear on the page. Many corporate email accounts have size limitations for each email. If you’re using images in an email, it’s best to make them as small in size as possible while still maintaining the desired quality. For small graphics, the GIF format might be an acceptable solution. For photos, or more complex and colorful images, go with JPEG, which maintains a high enough level of quality for most uses while keeping the file size relatively low. If you are involved with running a business, check out PEERNET’s line of document conversion software, which features products that are built with business in mind. https://www.peernet.com/wp-content/uploads/which-format-to-choose.jpg 1000 1000 Robert Massart https://www.peernet.com/wp-content/uploads/peernet-logo.png Robert Massart2014-08-14 16:24:182019-03-22 15:39:46What are the best file formats for my small business tasks?